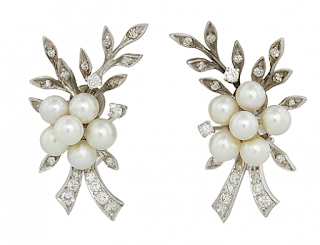 In the Passage's windows today, our New Year tradition of a pearl post, and this one is about romantic pearl earrings. 'Romantic' designs aren't geometric or minimal, but neither are they too girlish and twee. 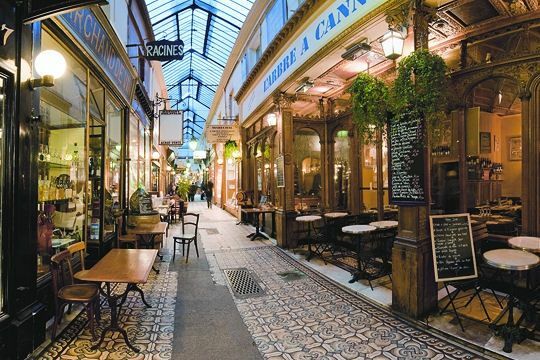 You will often see baroque, Edwardian or art nouveau period references. On sites, at shows, in stores, you can find a flood of bar or chevron studs; they are the gold ball stud of the mid-2000s. I skirt these. One of my favourite looks is an outfit of simple clothes with a smashing pair of earrings, so I reach to understand those anodyne bars. 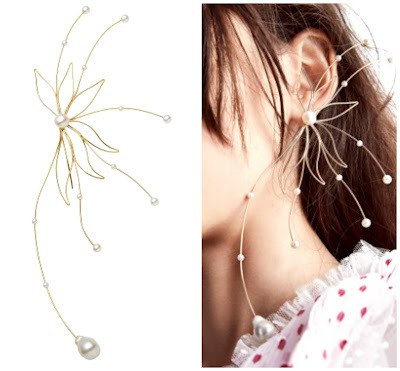 The 'smashing earrings' need not be romantic, but today's are, because I'm in the mood for them. Left: Provence pearl enhancers: the price is for the pearl 'charms' which hang for your existing hoops. 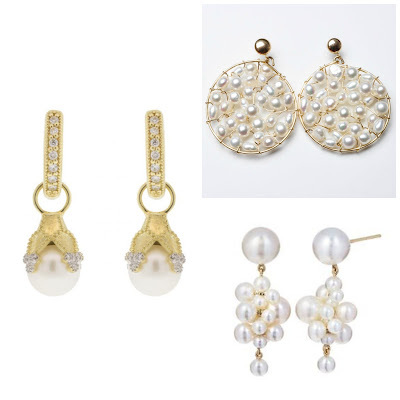 The enhancers are diamond, 18k gold, pearl. Price, $US 1, 100 from New Twist. Hoop charms are also a good reno idea, with or without gemstones. Upper right: Lower right: Medium pearl lace hoops by Judi McCormack, $US 395; also available as a small hoop with pearl stud, $US 250. Sophie Bille Brahe Pearl Botticelli earrings, $US 1, 155; white freshwater pearls, 9mm to 3mm, with gold. From Twist Online. These are 1 1/4 in. drops, so very day-wearable. Romantic jewellery must be well-designed or it looks busy and incoherent. When the workmanship is top-notch, the pieces seem of another era—and some of them are! I always look at the vintage market first, because of the superior workmanship. Below, Beladora 1960's pearl and diamond earrings in 14k white gold; price, $1, 150. I'd wear these with a simple skirt and blouse, or jeans and a turtleneck. Straight out of Midge Maisel's jewellery box! Romance of the audacious variety: Jan Logan's Orchid earring (sold as a single). Price $AUS 1, 550. Very special, as are several other singles she has created. Finale: Annette Ferdinandsen's work is distinct, graceful and enduring. 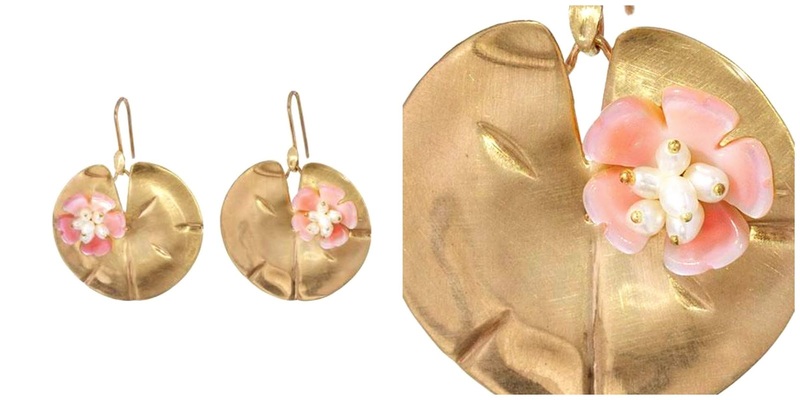 Below: Her Lily Pad earrings, with keshi pearls nestled into pale pink mother-of pearl blossoms on 10k yellow gold pads. Just exquisite and well worth the investment; price, $US 1, 900. By the time you're in the Passage, you likely have the basics covered. It's time to add some pieces of charm and character, either through buying, or by restyling what you have. 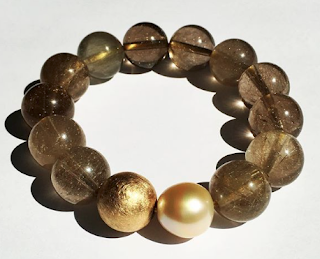 If restyling, choose an experienced jeweller, because many jewellers are a few beads short of a strand when it comes to making more complicated designs. Fine jewellers with an aesthetic sense and superb skills are out there, and as you know, I like to see them get our business more than the huge brands with their corresponding markups. Lily: Are you allergic to titanium, too? Happy New Year and welcome back! Love these romantic choices, you found a wonderful group to share with us today. The pearl lace hoops are lovely, a lot of presence with a light free feel. And the vintage earrings remind me of things I used to see in my mother's jewellery box. Wow, that orchid earring is quite the statement and a beautiful work of art. I also love those lily pads and could get quite a bit of wear from them. You have quite the eye for lovely. 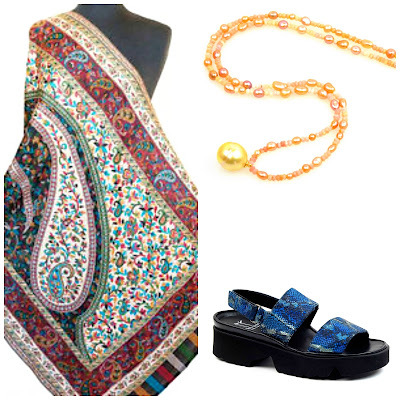 I also am glad you recommend a little bling with tee shirts and jeans. I have a pair of slide shoes that are all silvery and shiny on a lowish heel. Most reviewers on the website where I purchased said they returned them because they were “too fancy” for everyday. Au contraire. No better way to take the outfit up a notch, IMO. And, so glad you are back. Happy New Year. If you want buy womens casual dress pants in USA, then Heer Capries is one of the best choices for you.